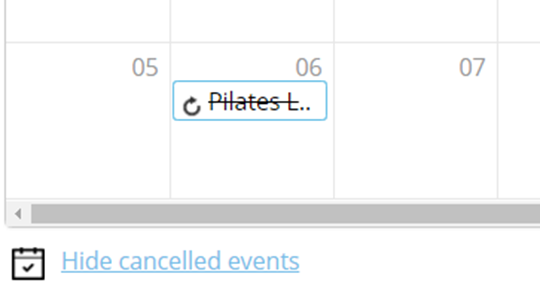 The planner is now cleaner – we've uncluttered the view and cancelled events are now hidden by default. Prefer how it looked before? Simply click on "Show Cancelled Events" and the system will restore all cancelled events until you switch back to the original calendar view. For our parks & recreation clients, you can show or hide cancelled events in Advanced Reservation as well. Previously when you wanted to set operational hours for statutory holidays, like New Year's, you had to add the recurring holiday to every year. 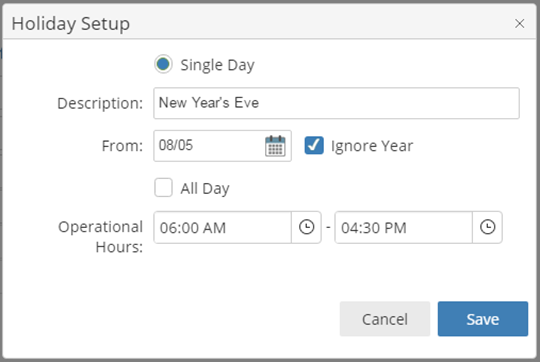 We understood that this could be tedious – this time-saving feature allows you to select the "Ignore Year" checkbox so you don't have to manually set holidays that fall on the same day each year, every year. Simply set the holiday once, and the system will apply it to all future years. For multi-location facilities, you can set up custom hours for each facility. It's an easy but irreversible mistake if your staff accidentally deletes an event - we've minimized the possibility of this error by disabling the ability to delete an event if it has already been registered or paid for. For events with enrolled or paid customers, you can still cancel the event without deleting it. A pop-up will appear asking you to cancel the event instead. We've made discounts available at the time of making a reservation. Say you'd like to make a 10% discount available for all seniors taking a swimming class. Currently, your staff would have to manually add a discount to each eligible event. Now, once you have a discount set up for a class, Fred at front-desk can easily apply the discount for eligible members from the picklist. For multi-location facilities, discounts from all locations will appear on the list. Jenna's parents are out of town and Aunt Sheila is chaperoning Jenna for the weekend. Aunt Sheila takes Jenna to her karate class and is informed by your front desk staff that there's an outstanding balance for Jenna's classes. With POS 2.0, you can select a contact in the system to pay for the invoice, or create a new account for Aunt Sheila as the payer. Accurately attribute payments to the correct person and ensure that refunds are credited back to the right person. Still on POS 1.0 and thinking about switching to enjoy the latest features like these? Call our support team to switch today! 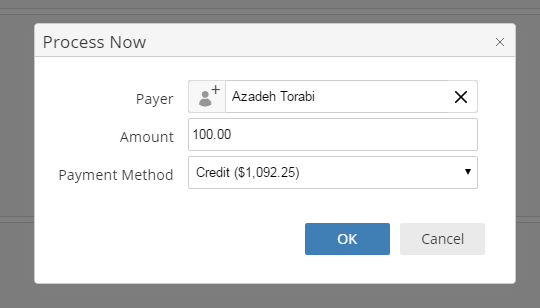 For POS 2.0 users, you can now create custom reports on sold memberships: report in a variety of ways on individual members assigned to memberships, even if they are not necessarily the contact(s) who paid for the membership. Easily track your members, the memberships they have, and their statuses from a single easy-to-reference table with this new report. Also accessible under the More Apps menu and the Contact layout, users can create customized views for this report. We've made the conflict manager smarter: the pop-up now tells you the name of the course and the course ID that the event is conflicting with. You can now click on the conflicting courses and resolve the conflict by changing the time, staff, and/or facility of either events. The pop-up will now also show the supervisor name if there is one. You can now search for courses based on season. For supervisors who want to review all yoga classes for summer 2017, you can add a new column for seasons and apply advanced filters to your search straight from PerfectMind without having to use Excel. Using POS 2.0 gives you more flexibility with memberships. There may be times where you may want to forego the payment plan option. POS 2.0 users can choose to sell any membership without a payment plan. By default, all staff user profiles are granted permission to increase or decrease punch pass memberships. Now, as a Global Admin, you can adjust these permissions for specific profiles – e.g. supervisors can adjust punch passes both ways, whereas front desk staff can only decrease punch passes. This new feature limits the possibility of accidental loss in revenue. You can also now keep track of previous punch pass memberships by scrolling through the member's profile.